Man wants to leave his imprint on the world. There are so many ways in which individuals seek to make their mark — none is as noble as bequeathing a legacy of knowledge which can be passed on to future generations. When the first encyclopedia on Sikhs was to be written, Bhai Kahan Singh Nabha was the right man for the task. His Mahan Kosh was the fist encyclopedia of Sikh literature in Punjabi. Decades later, when Punjabi University, Patiala, thought of bringing out the Encyclopedia of Sikhism in English, Professor Harbans Singh was the right person for the task which demanded knowledge of the Sikh religion and ethos, academic precision, as well as total dedication. It was thought that the project would take seven to eight years. It is now more that 15 years since Professor Harbans Singh started on this task, and it is only now that the fist volume (A to D) of the four-volume encyclopedia is to be released soon. How did he react when the Syndicate of the university asked him to take over this charge? “I was overwhelmed, but not intimidated by magnitude of this task, “ said Professor Harbans Singh when I met this 71-year-old scholar at Patiala recently. He soon realised that all the experts on various aspects could not be assembled under one roof. In fact scholar in specialised studies needed for the encyclopedia were far and few. This was a vast undertaking with more that 4,000 topics to cover. Contributions were received in English and Punjabi. Bringing coherence and uniformity to so many contributions is in itself no mean feat, but he did it. The Centre for Religious Studies at Guru Gobind Singh Bhavan, Punjabi University, Patiala, was the headquarters of a small editorial team which toiled under Professor Harbans Singh’s guidance till his ill health (he suffered from a stroke about two years ago) made him move to a village near Punjabi University campus. The venue changed, but work continued unabated. “There were no precedents to go by. (It was challenge)… in the absence of concisely argued work on the Sikh doctrine (even historical facts being far from sifted), along with the paucity of reliable and firm documentation.” But he took it up and surmounted various difficulties. But then, the man who led the team was no ordinary person. Born on March 6, 1921, at Kotha Guru in Bathinda district. Harbans Singh studied at Khalsa College, Amritsar, where he earned his BA Hons in English in 1941 and MA in English literature in 1943. He taught for a short while at the college where he had studied before joining Brijindra College, Faridkot, as Head of the Department of English in 1944. He was appointed the first Registrar of Punjabi University, Patiala, in1962, but academic pursuits rather than administrative chores continued to dominate his life. On he went to Harvard University’s Centre for the Study of World Religions in 1968-69. He took over as the head of the newly created Department of Religious Studies at Punjabi University, Patiala, on his return in ’69. He relinquished this post in 1972 to concentrate on the encyclopedia. A university appreciative of the work that Professor Harbans Singh was doing, awarded him a Life Fellowship after he retired in 1981. A prolific author, Professor Harbans Singh has a number of books to his credit. His books have been lauded by critics and his contribution has already ensured a place for him in Sikh literature. The encyclopedia will be his crowning glory. The Times Literary Supplement, London, commenting on his book Guru Nanak and the Origins of the Sikh Faith said: “ The book… excellently written… can be confidently commended… both as the best short study of Guru Nanak’s life, times, and doctrine which has so far appeared and as an outstanding example of modern Sikh scholarship”. A cheque of Rs 25,000 was also presented to him, but Professor Harbans Singh returned it with the request that this money be used for promoting Sikh studies. Professor Harbans Singh the scholar is well known. He was awarded an honorary Ph.D by Guru Nanak Dev University last year. But there is more that just a scholar in him. He is a gentleman. I have known him for almost two decades. He always exudes old-world charm and courtesy. Not only is “The Encyclopaedia of Sikhism” in English being published from Patiala, its precursor, Mahan Kosh, was also published form the same city in 1930. Bhai Kahan Singh Nabha’s authoritative Mahan Kosh (the Encyclopaedia of Sikh Literature) is in Punjabi and it was inspired by Encyclopaedia Britannica. Bhai Kahan Singh started work on Mahan Kosh in 1913 under the patronage of the Maharaja of Nabha. It was first published in 1930. The Maharaja of Patiala funded the first edition. There has been no comparable work since. But, Bhai Kahan Singh acknowledge his debt to the Gurgirath Kosh (A Dictionary of Gurbani) by Pandit Tara Singh Narotam which was published before 1900. Maharaja Narinder Singh of Patiala was the patron of this learned man who wrote extensively in Gurbani. The Heritage of the Sikhs. Guru Nanak and Origins of the Sikh Faith (also translated into Hindi and Urdu). Guru Gobind Singh (also translated into Assamese, Bengali, Gujarati, Hindi, Kannada, Kashmiri, Maithili, Malayalam, Marathi, Oriya, Punjabi, Sanskrit, Sindhi, Tamil and Telugu). Bhai Vir Singh (also translated into Punjabi, Hindi, Sindhi and French). Bhai Vir Singh: Poet of the Sikhs (in collaboration with Professor G. S. Talib). An Introduction to Indian Religions (in collaboration with Dr L. M. Joshi). Perspectives of Guru Nanak (ed). 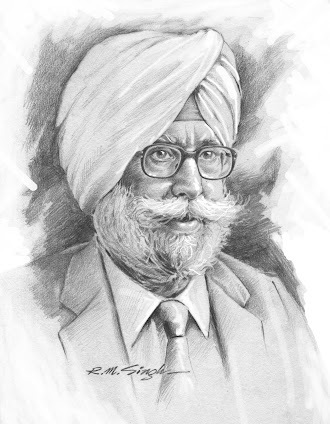 Punjab Past and Present: Essays in Honour of Dr Ganda Singh (ed). Mahindi (Short stories translation into English from Punjabi). Le Sikhisme (French) (In collaboration with Professor Michel Delahoutre). This article by Roopinder Singh was published in The Tribune.